Inspired by a passionate love of the Ocean, Rhythm of Blue’s line of decorative home accents will bring a taste of salty air and a fresh sea breeze into the heart of your home. Whether you are living on the coast or nestled in the mountains, our range of designs will delight and compliment your style. Founder of the company, Nancy Nicholson was born and raised on the Caribbean island of Antigua. 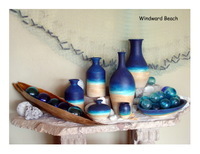 She has been digging clay and developing pottery which reflect her maritime history for the past twenty years. As a child she hunted in the hills for artifacts, uncovering designs created by the Amerindian’s in the pre-Columbian era. These designs are incorporated into the work today, bringing to light their symbolism, so they too can be uncovered by future generations. Through creative expression all cultures are linked together. The exciting collaboration of Nancy's creative passion together with the experience and talent of her colleague’s in Latin America enables you to have access to this unique pottery. The bold forms become the canvas for expression and each piece is unique and handmade. The year’s of experience of these artisans’s allows you to receive the pieces of your choice in the guaranteed time frame and to your expectation of Quality. A percentage of your purchase will be returned to the protection of the ocean from where this inspiration emerges. Together we can make a difference!